Composition: Phil Winsor, Cindy McTee. Master of Music Degree in Composition. Composition Studies with Tsung-Hsien Yang. National Tsing-Hua University, Taiwan, R.O.C., B.A. in Foreign Languages. Private Piano Studies with Gia-Lin Cheng. 1988-1991 Taipei Municipal Chien-Kuo High School, Taiwan, R.O.C. Teaching Assistant of Center for Experimental Music and Intermedia (CEMI) at the University of North Texas. 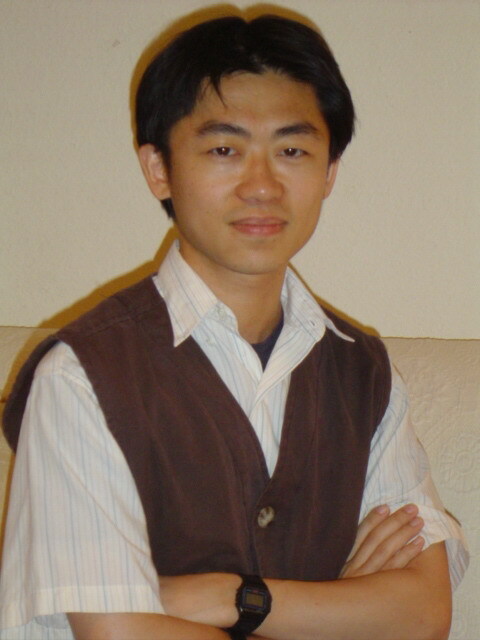 Guest composer and lecturer in Music Institute of National Chau-Tung University in Taiwan. Music Teacher in Shu-Lin Senior High School, Taiwan, R.O.C. Musical Composition Teacher in Chung-Ching Junior High School, Taiwan R.O.C. Intern Music Teacher in Sin-Pu Junior High School, Taiwan, R.O.C. Freelance Music Composer: composing multimedia music and IC music for CWEB Technology Incorporation, Leisure Machinery Corporation, E-com Technology Corporation, ATECH Total Solution Corporation, Internet Motion Navigator Incorporation and etc. Teaching Assistant of Computer Music Laboratory in Institution of Music in National Chau-Tung University in Taiwan. Music Arranger for Soiree 2000 of National Day of the Republic of China, Taiwan, R.O.C. Article Writer for “Digital Gallery of Music” Internet Project held by Council for Cultural affairs, Taiwan, R.O.C. Quartet piece Sail Away for clarinet, violin, cello, and piano was selected to be presented at the MusikTriennale Koln 2007 Festival in Germany in May 13, 2007. The stereo tape piece Under the Sea is selected to be presented in Bourges Synthese Festival 2006 in France on June 3, 2006. The stereo tape piece Under the Sea is selected to be broadcasted on	KUNM 89.9 FM, Albuquerque and KUNM.ORG	during the 10th	Santa Fe International Festival of Electroacoustic Music in New Mexico on Feb 5, 2006. The stereo tape piece Under the Sea and the audio-visual work Samsara are selected to be presented in the eleventh issue of the International Electroacoustic Music Festival "Primavera en La Habana" scheduled from March 6 to March 12, 2006. Audio-visual piece Samsara was selected to be presented in International Computer Music Conference (ICMC) in Barcelona in Spain on September 5, 2005. Tape music	Samadhi was selected to be presented in the 8th Annual Santa Fe International Festival of Electroacoustic Music on April 25, 2004. Tape music Samadhi was selected to be presented in the International Electroacoustic Music Festival “Primavera en La Habana” on March 18, 2004, held by the Cuban Institute of Music and the National Laboratory of Electroacoustic Music. Sweden on May 11, 2007. Tape piece Under the Sea was selected to be presented in 2007 Workshop on Computer Music and Audio Technology in Taiwan on March 24, 2007. The stereo tape piece Under the Sea is selected to be presented in 2007 SEAMUS National Conference at the Iowa State University of Science and Technology on March 9, 2007. The interactive piece Wind Sketch for soprano sax and Max/MSP is selected to be presented in 2006 SEAMUS National Conference at the University of Oregon in Eugene on March 31, 2006. The audio-visual piece Samsara was selected to be presented in 2006 Workshop on Computer Music and Audio Technology in Taiwan on March 18, 2006. Tape piece Samadhi was selected to be presented in 2005 Workshop on Computer Music and Audio Technology in Taiwan on March 12, 2005. Audio-visual piece Samsara was selected to be presented in SEAMUS National Conference 2005 at the Ball State University in Muncie in Indiana. Stereo piece Under the Sea was selected to be presented in LaTex 2005 Electronic Music Festival at the University of Texas-Austin on November 12, 2005. Audio-visual piece Samsara was selected to be presented in 2nd annual Bellingham Electronic Arts Festival at the Western Washington University in Washington on May 7, 2005. Video piece Samsara was selected to be presented in LaTex 2004 Electronic Music Festival at the Shepherd School of Music in Texas on November 14, 2005. Audio-visual piece Samsara was selected to be presented in Most Significant Bytes 2004 II multimedia concert. Quartet Sail Away for clarinet, violin, cello and piano won the 2007 Voices of Changes, Russell Horn Young Composers' Competition, and will be played by Voices of Change chamber ensemble in Caruth Auditorium at Southern Methodist University on March 25. Quartet Snow Spell for flute, erhu, cello, and piano was in the final list of 2006 Chang-huei Syu Internatioanl Composition Competition, and was sponsored to be performed in the final competition concert on December 5 in Taipei. The stereo tape piece Samadhi won the first prize in 2006 National On-line Arts Creativity Competition (under the category of electroacoustic music) administered by the Ministry of Education in Taiwan. The solo erhu composition, Tune of Late Spring won the 2nd place in the annual Fine Arts Creation Awards held by the Ministry of Education, R.O.C., Taiwan. The stereo tape piece Under the sea won the first prize in 2005 National On-line Arts Creativity Competition (under the category of electroacoustic music) administered by the Ministry of Education in Taiwan. Chamber piece A Message from the Night Rain won the fourth prize of the 3rd Percussion Music Composing Competition held by Taipei Percussion and will be presented in National Concert Hall in Taiwan on May 14, 2005. Chamber piece Autumn Leaves for Soprano Sax, Alto Sax and Piano was selected and sponsored by Chang-Huei Shiu Cultural Foundation to be performed in “2004 Young Composers’ Masterpieces” concert in Taiwan on September 26, 2004. Samadhi, Collection of Awarded Work in 2006 National On-line Arts Creativity Competition, GPN-4309504203, Taiwan. Tune of Late Spring, Collection of Awarded Work in 2006 Fine Arts Creation Competition, GPN-4309503219, Taiwan. Methink, featured on the SEAMUS 20th Anniversary Electroclips CD, EAM-2006-2, USA. Under the Sea, Collection of Awarded Work in 2005 On-line Arts Creativity Competition, ISBN-4309404027, Taiwan. Sail Away, Collection of Awarded Work in 2003 Fine Arts Creation Competition, GPN-4309204360, Taiwan. Endless Night for Soprano Voice and Piano, Anthology of Awarded Piece in the Fourth Annual Hakka Song Composition Competition, ISBN-9570276274, Taiwan. Sail Away reviewed by Scott Cantrell, “Dreamy ‘Sail’ engages at Voices of Change Concert,” Dallas Morning News, March 27, 2007. Samadhi reviewed by Larry Austin, “Center for Experimental Music and Intermedia: Forty Years on the Edge,” Computer Music Journal 28:4, Winter 2004. Image of Time reviewed by Nan-Chang Chian, “Is this the Tune of Taiwan?” Ming-Sheng Newspaper, Dec 12, 2002. Of the seven pieces performed Sunday evening by Dallas' new-music ensemble Voices of Change, at Caruth Auditorium, only one predated the 21st century, and by only a decade. The most intellectually engaging piece was the one-year-old Sail Away by Chien-Wen Cheng, a doctoral candidate in composition at the University of North Texas. This was an appealing essay in sounds and ideas drifting in and out, as in a dream, with sophisticated interactions of clarinet (Brent Buemi), violin (Lisamarie Vana), cello (Gayané Manasjan Fullford) and piano (Voices artistic director Joe Illick). Mr. Cheng was presented Voices' annual Russell Horn Young Composers Award.